CORDIO, WCS and Blue Ventures with support from WIOMSA and the John D. and Catherine T. MacArthur Foundation have published a report highlighting a background situation analysis of locally managed fisheries. 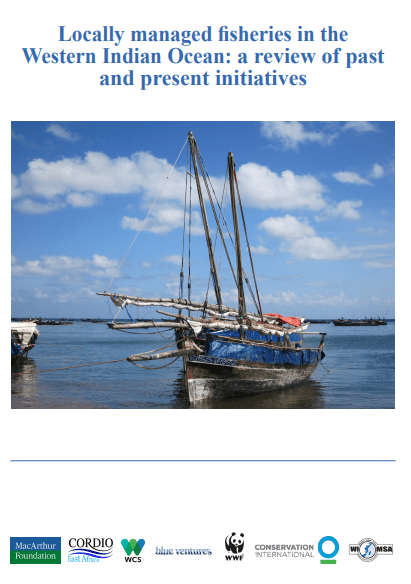 The report provides information to aid in the design a regional network for locally managed fisheries in the Western Indian Ocean (WIO) focussing on Kenya, Tanzania, Mozambique, and Madagascar. The purpose of such a network would be to facilitate wider and more rapid uptake of effective and replicable local fisheries management approaches. The review first describes the nature of small-scale coastal fisheries in the WIO, highlight the issues and problems they face, provides some historical perspective by country, and explains the legislation behind their management. Case studies of successful local fisheries management approaches are then presented. The report is concluded with a discussion of these case studies in the context of the potential for a regional network for locally managed fisheries in the WIO.